Gazing at the Ionian Sea! 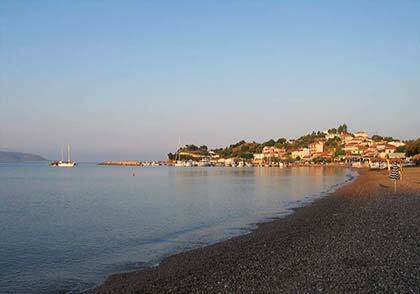 In the southwestern part of Messenia and Peloponnese stands a small coastal town gazing at the Ionian Sea. 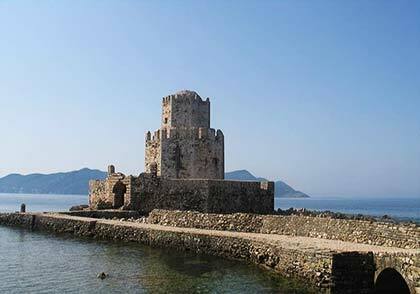 It is Methoni, another town of Messenia with its roots in antiquity and an important role during the medieval era. Undeniable witness is its imposing Venetian castle. Methoni is located on the southwestern edge of Messenia, south of Pylos and west of Finikounda and Koroni. It is 61 km from Kalamata and has 1,200 residents. East of the city stretches the bay of Methoni, where is a sandy beach with shallow waters. South at 3 nautical miles is the island of Sapienza, separated by the Strait of Methoni with a length of 2 nm and a width of 1 nm. 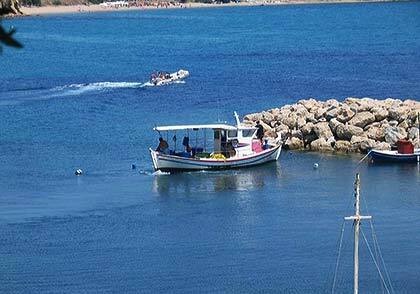 We can reach Methoni either from Pylos or from Koroni. The town is connected by bus with Kalamata via Pylos (KTEL of Messenia). There are five daily scheduled departures from Kalamata, four from early morning until noon and one in the evening. There are hotels and rooms to let; also a municipal campsite. 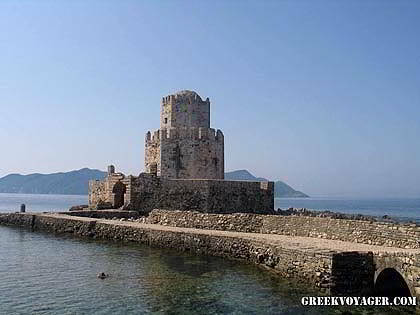 Methoni occupies the same location since antiquity. It was one of the most important ports due to its strategic position. It is referred as one of the seven cities offered by Agamemnon to Achilles as a dowry to marry his daughter. 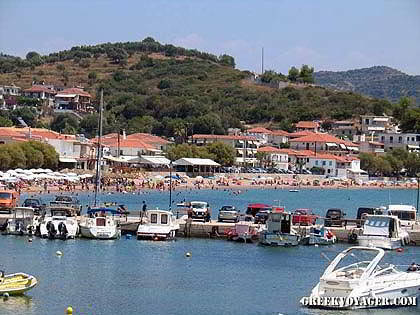 According to Pausanias, the first name of the city was Pedassos. During the historic period it was named Mothoni by a rock called Mothon lithos (stone), extending from the coast as reef beneath the sea forming a narrow strait at the entrance of the bay. According to another aspect, the city took its name from Mothoni, daughter of the first settler Ineas. In the 8th century BC, it was conquered by the Spartans, when during the First Messenian War dominated Messenia. In 431 BC the Athenians failed to conquer it. 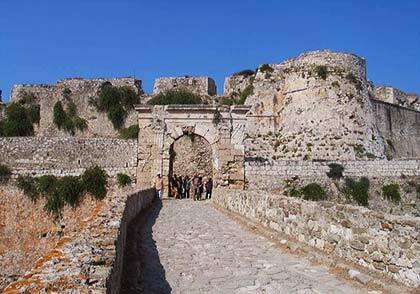 The Spartans left in 338 BC and in 191 BC Methoni became a member of the Achaean League. In 31, was occupied by the Romans, but later declared independent by the emperor Trajan. In 365 AD, it was destroyed by the great earthquake that struck South Peloponnese. The town reached its peak during the Byzantine and Venetian era. In 533 became a base of the Byzantine fleet. In 1204 the Frankish era began in Greece and one year later the Franks arrived. 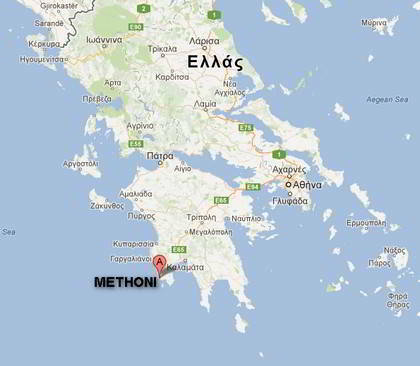 At that time Methoni was named Modon. In 1209 the Franks gave the city to the Venetians, who fortified it and made it a naval base, same as Koroni. In 1481 they strengthened the defense by opening a ditch, which still exists. In 1500 the Turks came; in 1686 the Venetians and in 1715 the Turks again. From that moment Methoni began to decline. In 1825 Ibrahim Pasha of Egypt landed his forces at Methoni and began to spread terror in the Peloponnese threatening the Greek Revolution until his defeat in 1827 at the Battle of Navarino by the fleets of the three great powers of the time; England, France and Russia. Already on April 30,1825, the Greek fleet had attacked with fire ships the port of Methoni; Egyptian ships were burned and powder kegs and parts of the castle blown up. Methoni, like the other towns in the region, was liberated in 1828 by General Maison, head of a French expeditionary force. Maison took care of removing the ruins from the castle and restored the stone bridge leading to the main gate. The new houses of Methoni were built outside the castle. Methoni is built on the northwest side of the open bay with the same name, stretching on the east. Picturesque and quiet, it has two main roads; one leads to the city center, the market, the other brings to the castle and the beach. Of particular interest is the church of Aghios Onoufrios, built in a cave. An important early Christian monument is the catacombs of St. Onoufrios; there is a cemetery carved with six chambers and twenty eight graves. Another important Byzantine monument is the church of Aghios Vasilios (St. Basil) built in the 10th to 11th century. But first and foremost attraction is the castle of Methoni reminding the adventurous life of the city over the centuries. 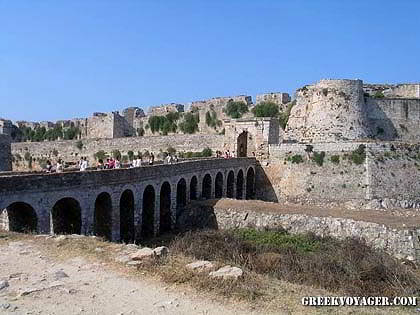 It is one of the finest and fortified Greek castles. The castle dominates the area of the west coast, built on a small peninsula to south, surrounded by the sea. It is polygonal and extends to over 93 acres. Inside are the few remains of the ancient city; parts of the foundations of the ancient wall can be found at the base of the Venetian fortifications. Walking along the stone bridge to the castle every step brings us closer to medieval times. This bridge of fourteen arches once replaced the first wooden one. The bridge was necessary to connect the castle with the mainland since the Venetians opened a trench for greater protection. Our steps bring us to the main gate on the north side of the castle. The main gate is in itself a unique monument. Made of rectangular limestones is very impressive with its attractive decoration. From this a road beneath a vaulted roof passes through another gate and then another. The third gate leads to a large courtyard. The walk through the castle brings us in front of the ruins of houses, a hammam, and parts left from the old church of Aghia Sophia. But still exists and functions the small church of Aghia Sotera, built by the French soldiers after 1828, when they liberated the city. While our walk brings us to the walls with towers and bastions, we stand in front of embedded embossed with the Lion of Saint Mark and Venetian coats of arms and inscriptions,. On the northwest side is the platform for the artillery. Thanks to escutcheons we know the date on which the various structures were built. We reach the south gate; the imposing Gate of the Sea. Through the opening we can see Bourtzi, a tower built on a small rocky island, once called Sakouli (Bag) or Helonaki (Little Turtle). A paved walkway leads to the impressive medieval building with terraces and ramparts. It was built by the Venetians to protect the entrance to the harbor. Easy to understand just looking toward the east, where a jetty extends and behind it the port of Methoni. Finikoundas is one of the most famous seaside resorts of Messenia located on the road connecting Koroni, Methoni and Pylos. It is 68 km from Kalamata and has 650 residents. The region is well organized for holidays and has endless sandy beaches. 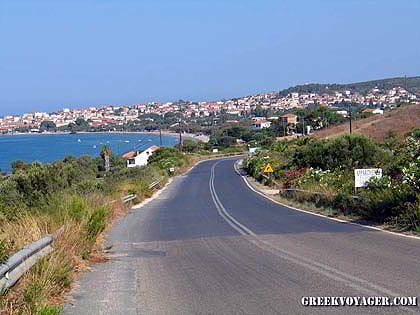 We can reach Finikoundas from Kalamata taking the road to the south and turning left just before arriving to Koroni; also, taking from Kalamata the road towards Pylos and then south passing Methoni. Finikoundas is connected by bus with Kalamata via Pylos. There are three scheduled departures from Kalamata, from early morning till noon (KTEL Messenias). Finikoundas is a picturesque fishing village stretched in the sheltered cove of a large bay formed in the middle of the southern coast of the Messenian peninsula. It has Phoenician origin. According to Pausanias it was a trading post founded by the Phoenicians, who named it “Finikous Limen” (Finikous Harbor). The settlement preserves its architectural character with the narrow streets leading to the large square, where is the harbor. Around the square and higher on the right side are taverns and cafes. On the left side lies the beach with fine colored pebbles..
At the entrance of the settlement we can find space for parking, necessary for the summer traffic. In the area are hotels, hostels, rooms to let and large camping sites. Camping sites are on the beaches Thines (Dunes), Ammos (Sand) and Anemomylos (Windmill); also on the beach Loutsa one km east. A little further, an earthy road starting in Akritochori leads to the small bay Marathi with two nice beaches. Further south is Tsapi (see “Koroni”). 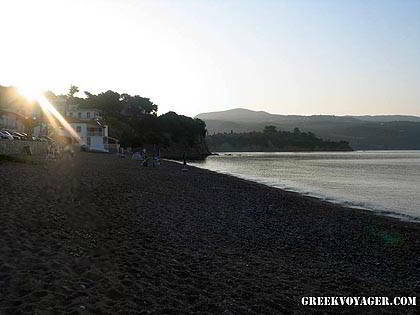 West from Finikoundas, next to the main road, spreads the long sandy beach Makrynamos. At one end a small peninsula ends at Cape Kolyvri. Opposite, in short, is the northern tip of the island of Schiza, which belongs to the island cluster of Inousses (Oinousses) with the island of Sapienza further west and some rocky islets. Opposite of the southwestern coast of Messenia is the island cluster of Inousses consisting of the small islands of Sapienza and Schiza, the islet of Aghia Mariani and some rocky islets and rocks. Another island cluster with the same name is located in the Northeastern Aegean near the island of Chios. The Inousses of Messenia are famous internationally because of the Well of the Inousses in the south, where until a few years the deepest known point in the Mediterranean had been measured; a major scientific research takes place there. In recent years two other deeper points have been measured eastwards, towards the Cape Taenaron. Inousses have the same name since antiquity. Inoussa was the ancient name of the island of Sapienza, came from Ineas, the first settler. The islands are also named Sapientzes. The island of Sapienza is located south of the town of Methoni, in the southwestern edge of Messenia. Between the island and the coast the sea strait of Methoni has a length of 2 nautical miles and a width of 1 nautical mile. The northern coast of Sapienza is 3 nautical miles from Methoni. The island has an area of 8 sq km, a length of 6, 5 km and a width of 3 km. The higher hill is Spartolakka at a height of 219 m. Sapienza is a nice destination for those travelling by yacht. It is an important habitat with particular flora and rich fauna. The coast in most part is rocky and steep, but there are points for approach. The island is separated in two parts by a narrow piece of land named Laemos (Neck). The northern part is larger. On the northern coast, opposite to Methoni, spreads Ammos (Sand), the unique beach of the island; is sandy and leeward with a small pier. At the northern tip, Cape Karsi, at shallow depth near the shore, but also deeper, are findings from the load of old shipwrecks. The sea area is a paradise for fans of diving. The western coast is rocky; there is, however, a beautiful tiny cove called Maneta. Sapienza is covered by lush vegetation, which in combination with the ground offers the perfect environment for Cretan wild goat (kri-kri), wild sheep and many species of birds. In the center of the northern part, where is the highest hill Spartolakka, a forest of arbutus trees grows, the only of this kind in the Mediterranean. The plants, which in other places are bushes, here are tall trees, some over ten meters. Also, in a plateau, a paradox, but remarkable geological phenomenon is noticed. During the years the pollen of flowers formed a rock in orange and yellow color. The region and the forest have been declared as a natural monument and attract the scientific interest. In the narrow region of Laemos, in the east coast, a beautiful enclosed bay is formed, called Porto Loggo; it is a point of approach and safe anchorage from ancient times until today. In the open of the bay is the rocky islet Bomba (Bomb). According to tradition, the ship in which Apostle Paul traveled to Rome, fell into a violent storm and took refuge in this rock. On the other side, near the west coast, are two tiny rocky islets named Paporia (Ships). From Porto Loggo begins the path towards the southern tip of the island, called Dichazi. Here is a beautiful lighthouse, eighteen meters high, built in 1890 by the British. Seventy five stone steps lead to the highest point, from where the view is amazing. Opposite are the rocky islets Dyo Adelfia (Two Brothers); in the largest some ruins remind an older lighthouse. Southwest, not far away, is the famous Well of Inousses. East of the island of Sapienza is the island of Schiza. It has an area of ​​11, 5 sq km, a length of 7 km and a width of 3 km. The highest point is Vigla at a height of 201 m.
On the island there is a beautiful cave. The coast is rocky and the depths around it big. The point of approach is a bay which goes deep into the land on the south side. Near the east coast are the rocks named Arnatsi and near the west coast the islet of Aghia Mariani (St. Mariani) with a height of 30 m. So is called the chapel on the north side.